"Ngorongoro" redirects here. For the district, see Ngorongoro District. The Ngorongoro Conservation Area is a protected area and a World Heritage Site located 180 km (110 mi) west of Arusha in the Crater Highlands area of Tanzania. The area is named after Ngorongoro Crater, a large volcanic caldera within the area. The conservation area is administered by the Ngorongoro Conservation Area Authority, an arm of the Tanzanian government, and its boundaries follow the boundary of the Ngorongoro Division of the Arusha Region. The name of the crater has an onomatopoeic origin; it was named by the Maasai pastoralists after the sound produced by the cowbell (ngoro ngoro). Based on fossil evidence found at the Olduvai Gorge, various hominid species have occupied the area for 3 million years. The main feature of the Ngorongoro Conservation Authority is the Ngorongoro Crater, the world's largest inactive, intact and unfilled volcanic caldera. The crater, which formed when a large volcano exploded and collapsed on itself two to three million years ago, is 610 metres (2,000 feet) deep and its floor covers 260 square kilometres (100 square miles). Estimates of the height of the original volcano range from 4,500 to 5,800 metres (14,800 to 19,000 feet) high. The crater floor is 1,800 metres (5,900 feet) above sea level. The crater was voted by Seven Natural Wonders  as one of the Seven Natural Wonders of Africa in Arusha, Tanzania in February 2013. The Ngorongoro volcano was active from about 2.45 to 2 million years ago. Out of the two recent volcanoes to the northeast of the Empakaai caldera, Kerimasi and Ol Doinyo Lengai, Doinyo Lengai is still active and had major eruptions in 2007 and 2008. Smaller ash eruptions and lava flows continue to slowly fill the current crater. Its name is Maasai language for ‘Mountain of God’. The crater highlands on the side facing the easterly trade winds receive 800 to 1,200 millimetres (31 to 47 inches) of rain a year and are covered largely in montane forest. The less-steep west wall receives only 400 to 600 millimetres (16 to 24 inches) and is grassland and bushland dotted with Euphorbia bussei [es] trees. The crater floor is mostly open grassland with two small wooded areas dominated by fever tree (Vachellia xanthophloea). The Munge Stream drains Olmoti Crater to the north, and is the main water source draining into the seasonal salt lake in the center of the crater. This lake is known by two names: Makat as the Maasai called it, meaning salt; and Magadi. The Lerai Stream drains the humid forests to the south of the Crater, and it feeds the Lerai Forest on the crater floor - when there is enough rain, the Lerai drains into Lake Magadi as well. Extraction of water by lodges and Ngorongoro Conservation Area headquarters reduces the amount of water entering Lerai by around 25%. The other major water source in the crater is the Ngoitokitok Spring, near the eastern crater wall. There is a picnic site here open to tourists and a huge swamp fed by the spring, and the area is inhabited by hippopotamus, elephants, lions and many others. Many other small springs can be found around the crater's floor, and these are important water supplies for the animals and local Maasai, especially during times of drought. Because of the variety of animals present, the Ngorongoro Crater is a well known tourist attraction. The Ngorongoro Conservation Area also protects Oldurai or Olduvai Gorges , situated in the plains area. It is considered to be the seat of humanity after the discovery of the earliest known specimens of the human genus, Homo habilis as well as early hominidae, such as Paranthropus boisei. The Olduvai Gorge is a steep-sided ravine in the Great Rift Valley, which stretches along eastern Africa. 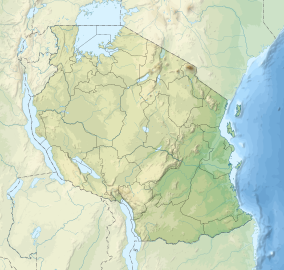 Olduvai is in the eastern Serengeti Plains in northern Tanzania and is about 50 kilometres (31 mi) long. It lies in the rain shadow of the Ngorongoro highlands and is the driest part of the region. The gorge is named after 'Oldupaai', the Maasai word for the wild sisal plant, Sansevieria ehrenbergii. Approximately 25,000 large animals, mostly ungulates, live in the crater. Large mammals in the crater include the black rhinoceros (Diceros bicornis michaeli), the local population of which declined from about 108 in 1964-66 to between 11-14 in 1995, the African buffalo or Cape buffalo (Syncerus caffer), and the hippopotamus (Hippopotamus amphibius). There also are many other ungulates: the blue wildebeest (Connochaetes taurinus) (7,000 estimated in 1994), Grant's zebra (Equus quagga boehmi) (4,000), the common eland (Taurotragus oryx), and Grant's (Nanger granti) and Thomson's gazelles (Eudorcas thomsonii) (3,000). Waterbucks (Kobus ellipsiprymnus) occur mainly near Lerai Forest. Absent are giraffe, impala (Aepyceros melampus), topi (Damaliscus lunatus), oribi (Ourebia oribi), crocodile (Crocodylus niloticus). cheetah (Acinonyx jubatus raineyi), East African wild dog (Lycaon pictus lupinus), and African leopard (Panthera pardus pardus) are rarely seen. Spotted hyenas (Crocuta crocuta) have been the subject of a long-term research study in the Ngorongoro Conservation Area since 1996. Although thought of as "a natural enclosure" for a very wide variety of wildlife, 20 percent or more of the wildebeest and half the zebra populations vacate the crater in the wet season, while Cape buffalo (Syncerus caffer) stay; their highest numbers are during the rainy season. Since 1986, the crater's wildebeest population has fallen from 14,677 to 7,250 (2003-2005). The numbers of eland and Thomson's gazelle also have declined while the buffalo population has increased greatly, probably due to the long prevention of fire which favors high-fibrous grasses over shorter, less fibrous types. Serval (Leptailurus serval) occurs widely in the crater. Hook-lipped (black) rhinoceros in the crater. Safari vehicles in the crater. Plains zebras in the crater. Fire is used to manage vegetation in the crater. Masaai herdsman with cattle inside the crater. Wildebeest and zebra in a herd. Female lions on the hunt in the crater. Lioness, zebras and wildebeest in the crater. Maasai boma within the conservation area. The Ngorongoro Conservation Area has a healthy resident population of most species of wildlife. The Ndutu Lake area to in the west of the conservation area has particularly strong cheetah and lion populations. Common in the area are hartebeest (Alcelaphus buselaphus), spotted hyena (Crocuta crocuta), and jackals. The population of African wild dog may have declined recently.[when?] Servals occur widely on the plains to the west of the Ngorongoro Crater. The annual ungulate migration passes through the Ngorongoro Conservation Area, with 1.7 million wildebeest, 260,000 zebra, and 470,000 gazelles moving south into the area in December and moving north in June. This movement changes seasonally with the rains, but the migration traverses almost the entire plains in search of food. Richard Scarry's children's book What Do People Do All Day has a character named Ngorongoro Crater, a hyena cameraman. The location, or "zone", of "Un'goro Crater" in the popular video game, World of Warcraft, takes its name from the Ngorongoro Crater. ^ a b c Laltaika, Elifuraha (2013). "Pastoralists' Right to Land and Natural Resources in Tanzania" (PDF). Oregon Review of International Law. 15 (1): 43–62. ISSN 1543-9860. Retrieved 12 June 2017. ^ a b Robert M. Poole. "Heartbreak on the Serengeti". National Geographic. p. 4. Retrieved 2008-02-21. ^ Homewood, K. M.; Rodgers, W. A. (2004-08-19). Maasailand Ecology: Pastoralist Development and Wildlife Conservation in Ngorongoro, Tanzania. Cambridge University Press. ISBN 9780521607490. ^ Hodgetts, Timothy; Lewis, Melissa; Bauer, Hans; Burnham, Dawn; Dickman, Amy; Macdonald, Ewan; Macdonald, David; Trouwborst, Arie (2018-06-02). "Improving the role of global conservation treaties in addressing contemporary threats to lions". Biodiversity and Conservation. 27 (10): 2747–2765. doi:10.1007/s10531-018-1567-1. ISSN 0960-3115. ^ a b c d e f g h i Estesa, R. D.; Atwood, J. L.; Estes, A. B. (2006). "Downward trends in Ngorongoro Crater ungulate populations 1986–2005: Conservation concerns and the need for ecological research" (PDF). Biological Conservation: 107. ^ a b Sinclair, A. R. E.; Packer, Craig; Mduma, Simon A. R.; Fryxell, John M. (15 May 2009). Serengeti III: Human Impacts on Ecosystem Dynamics. University of Chicago Press. ISBN 9780226760353. Retrieved 12 June 2018 – via Google Books. ^ "About – Seven Natural Wonders". sevennaturalwonders.org. Retrieved 12 June 2018. ^ "Seven Natural Wonders of Africa – Seven Natural Wonders". sevennaturalwonders.org. Retrieved 12 June 2018. ^ Deocampo, D.M. (2004). "Hydrogeochemistry in the Ngorongoro Crater, Tanzania, and implications for land use in a World Heritage Site". Applied Geochemistry. 19 (5): 755−767. Bibcode:2004ApGC...19..755D. doi:10.1016/j.apgeochem.2003.10.006. ^ "Management of Black Rhino in the Ngorongoro Crater" (PDF). African Wildlife Foundation. 2003-09-04. Retrieved 2008-02-21. ^ a b c d e f g h i j k "Ngorongoro Conservation Area". United Nations Educational, Scientific and Cultural Organization – World Heritage Centre. Retrieved June 3, 2014. In summer enormous numbers of Serengeti migrants pass through the plains of the reserve, including 1.7 million wildebeest, 260,000 zebra and 470,000 gazelle. ^ Kissui, B. M.; Mosser, A.; Packer, C. (2010). "Persistence and local extinction of lion prides in the Ngorongoro Crater, Tanzania". Population Ecology. 52: 103−111. doi:10.1007/s10144-009-0176-y. ^ Education, Jacana; Watson, Dave (12 August 2008). Ngorongoro Visitor Map Guide. Jacana Media. ISBN 9781770091733. Retrieved 12 June 2018 – via Google Books. ^ a b na. ProQuest. ISBN 9780549678335. Retrieved 12 June 2018 – via Google Books. ^ na. ProQuest. ISBN 9780549678335. Retrieved 12 June 2018 – via Google Books. Wikimedia Commons has media related to Ngorongoro.